Iron bars do not a prison make, and Zita isn't about to allow the charges of a power-mad prosecutor keep her from losing her spirit of independence. But the warden has other plans to break her will, and it might just be enough to end Zita's explorations forever in the climax to Ben Hatke's trilogy. Picking up exactly where Legends left off, Zita finds herself facing trumped up charges and more serious consequences for her actions (both good and bad) as we reach the end of the character arc. Learning quickly that her oppressor is unlike anything she's faced before, Zita has to come face to face with the consequences of her actions, making it necessary for her to make choices she'll have to live with. What's even better here is that we see that Zita's prior heroic acts aren't always quite what they seemed, particularly in a callback all the way to the first volume. Though I figured out the twist quickly, I expect it will surprise many readers of all ages, and it forces us to re-think everything we knew about Zita. Has she really changed and can she ever make up for what she did? Even after finishing this book, I'm not sure the answer is yes, quite frankly, and if there are more Zita books in Hatke's future, I expect that question will be explored further. Despite the fact that Zita's cast has grown a little large by this point, Hatke handles it well, and makes sure that we get a chance to reconnect with everyone, from the cat and mouse to aggressive robot "one." Some scenes are brief, but it's nice to see no one was forgotten. I also like how a seeming throwaway moment in the second book becomes key to everyone returning together. It shows some nice multi-book plotting by Hatke. In addition to the old gang, we get two new characters who help Zita, a self-aware set of rags and a master thief reduced to an animated skeleton. The two provide comic relief and biting commentary, depending on the need, becoming just the creatures Zita needs without it seeming contrived, like Piper and Madrigal before them. Speaking of those two, the pair of ex-lovers get a few moments that show the evolution of their relationship, though I do think this happens a bit too easily. Still, it's Zita's story, so only so many pages can be devoted to the others, so it was good to see Hatke get this in, even if it felt a bit rushed. Overall, however, despite so much going on, Return feels like it's just about the right length, refusing to extend out Zita's mental torture in the dungeons or anything else for too long. Sometimes comics have a really bad habit of belaboring a point to get an extra few issues or books out of the deal. Hatke instead opts for the direct route, allowing him to wrap things up and put Zita on the path to new adventures while still closing things out in a way that's extremely satisfying. We know how this story has to end--for now, at least--and the getting there was a lot of fun. Given a new world to play with that can feature creatures from all over, Hatke again makes his universe come alive. From the seemingly endless drudgery of the dungeon to a warehouse of confiscated items that allows him to bring back a thing or two for a final go, this is a place that screams despair at the reader. It's cold and metallic, but doesn't feel like a knock-off of, say, the Death Star, a very real problem when you're doing a space fantasy trilogy with a young hero(ine). There's still the almost steampunk nature of the architecture going on, with extra lines, pipes, windows, and other things that make for good hiding places when needed. The new creatures are a ton of fun, too. He creates living coal creatures with eyes that plead as they're destroyed, for example. A crowd scene features a brain-colored Rubic's Cube with legs, another creature with a zipper directly attached to its skin, and something that looks vaguely dinosaur-like. Piper uses a "midas coin" to encase a robot in gold, and "one" fights gigantic mechanical beasts for fun. It's clear that Hatke has a lot of fun designing these creatures and putting them in the background for readers to linger over. In addition to the big picture, however, Hatke also does a really strong job with the layouts in this final part of the story. As I noted going back to the first book, Hatke's panel constructions and page designs show a lot of talent and skill, and this time around, it's really amazing. From the opening scenes which make Zita look as small as possible, with escape nearly impossible to an image near the end where Zita is ready to end the Dungeon World and its master once and for all, there's a great change of how Zita is shown. We get to watch her nearly break, but not quite. Other great touches include the way that the reader's eye is directed down to a mystery character's revealed face, the body posture of the first time Madrigal and Piper interact versus the last time we see them together, and the laser blast "one" makes that hits an unexpected target. Hatke's best layout moments, though as saved for Zita's pressure point moments. When confronted by others and forced to make key decisions, Hatke slowly brings Zita closer and closer to the reader, until we turn the page and her choice is sealed. It's great dramatic tension, page after page. 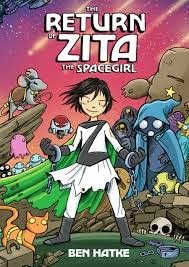 Return of Zita the Spacegirl was a great ending to the series, doing just the right things at the right time to deliver the ending that fit the theme of the books. I look forward to seeing what Hatke does next.